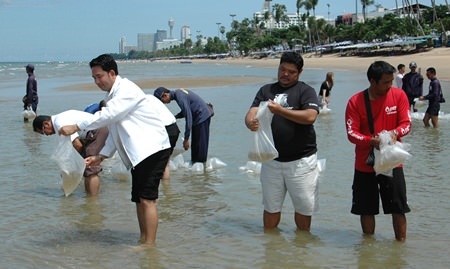 Members of Pattaya’s local fishermen’s association helped restock Pattaya Bay by releasing more than 200,000 shrimp into the sea off Jomtien Beach. 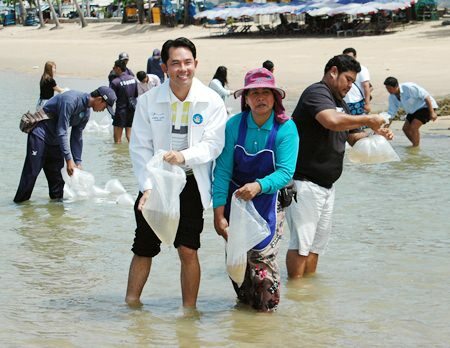 Mayor Itthiphol Kunplome joined representatives from the Chonburi Fishing Department and Small Fishermen Club opposite the Furama Jomtien Beach Hotel Sept. 3. 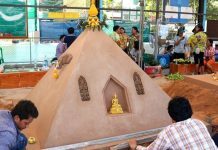 Saeree Jampangern, director of the Pattaya Tourism and Sports Department, acknowledged that overfishing, along with natural causes, have sorely depleted local waters, imperiling future food supplies. 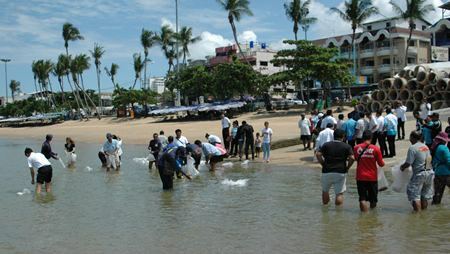 Mayor Itthiphol Kunplome and representatives from the Chonburi Fishing Department and Small Fishermen Club release shrimp into the sea off Jomtien Beach. Itthiphol said the city has, for eight years, worked to restore the marine ecosystem through fish and animal releases, including sinking old pipe material to form man made reefs about two kilometers from shore between 10 and 15 meters deep. It’s hoped they lay the foundation for a new habitat, he said.